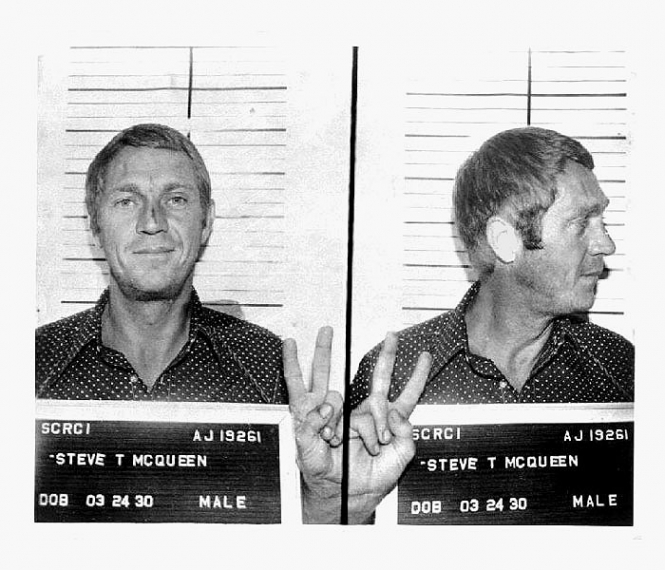 In 1972, actor Steve McQueen was busted in Anchorage, Alaska for drunk driving. The star of films such as "The Magnificent Seven" and "The Great Escape" posted bail and left town. He was later convicted in absentia for reckless driving. Thanks to Chris Lambos, who runs a McQueen site, for providing us with this photo. Submitted by Midknight on Thu, 2011-05-12 05:33. Submitted by james99501 on Tue, 2011-02-22 03:42. I met the arresting officer in Anchorage at the Fly-By-Night Club in 1994... he said that he had pulled Steve McQueen over on 4th Avenue, downtown, because he was spinning 'donuts' in the road... McQueen looked at him from the car and said "There ain't a two-bit cop in this one-horse town that's going to arrest me." I assume that his scuffed nose is the result of that conversation. Submitted by gotmyionit on Fri, 2011-01-14 23:59.